A cable that offers high-end results at half the price! The Lava Soar is Lava Cable's official entry into the true high-end guitar cable category. 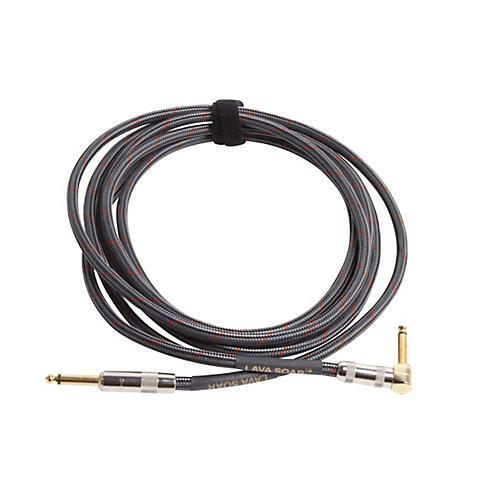 Based on proven high-end guitar cable design principles, the cable features dual 99.99% pure OFC solid copper conductors in a unique configuration, dual layers of tailored shielding, and a rugged outer braid. It comes with highly conductive Lava Silver Wire plugs standard as part of a complete matched plugs-to-cable design. Durability over flexibility was chosen in the solid-core design and as a result the cable is slightly stiffer than an average stranded cable, but the Lava Soar still retains a nice lay and feel. Our goal with this cable is to provide same results at nearly half the price of other high end cables in this category. With low capacitance of 29 pF/ft in the sweet spot zone, it provides outstanding detailed frequency response so you can hear your guitar the way it was meant to be heard. Your tone will reach new heights with the Lava Soar. This cable is completely Made In the USA - this includes the bulk cable, the plugs and final assembly. Straight ¼" to right angle ¼"
Let your tone reach new heights.